Barnabas Coffin Hinshaw5,6,7,8,9 [Barney C. Hinshaw10,11, Barney C. Henshaw12]. Hinshaw, Barnabas C., accused of fatally stabbing Abraham Heaston. Henshaw, Barney, age 38, born in Indiana; parents born in North Carolina; farmer. Henshaw, Leah, wife, age 28, born in Indiana; parents born in Pennsylvania; keeping house. Henshaw, Benj. F., son, age 12, born in Indiana; parents born in Indiana; attended school. Henshaw, Noble, son, age 4, born in Indiana; parents born in Indiana; attended school. Henshaw, Barney, age 59, born Mch 1841 in Indiana; parents born in North Carolina; married 32 years; occupation: farmer; owned farm (free). 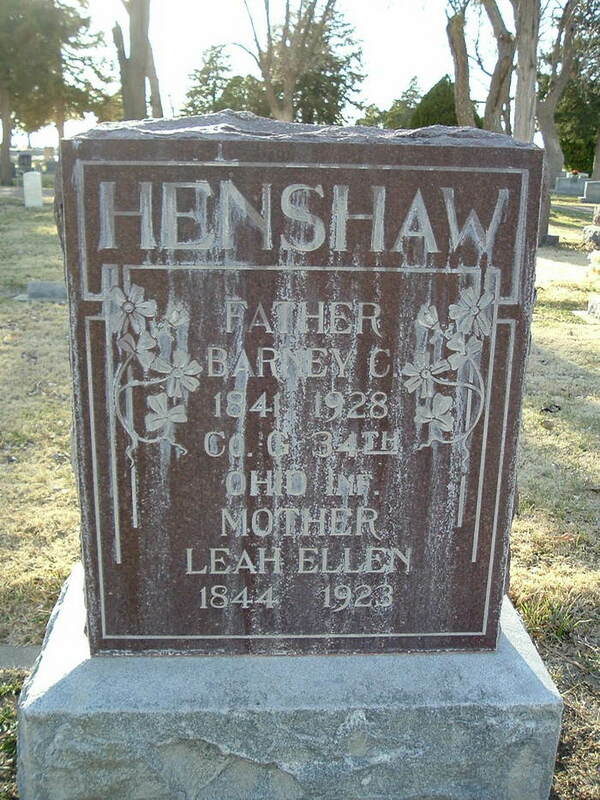 Henshaw, Leah, wife, age 55, born Oct 1844 in Indiana; parents born in Pennsylvania; married 32 years; 5 children, 3 living. Henshaw, Noble C., son, age 24, born Mch 1876 in Illinois; parents born in Indiana; occupation: farmer. Henshaw, Ella J., daughter, age 15, born Dec 1884 in Missouri; parents born in Indiana; attended school 5 months. Hinshaw, Barney C., head-of-household, age 79, born in Indiana; parents born in North Carolina; owned home; retired. Hinshaw, Leh E., wife, age 76, born in Indiana; parents born in Pennsylvania. Hinshaw, Ben F., son, age 50, born in Indiana; parents born in Indiana; single; occupation: laborer, street. Contra, Ella J., daughter, age 30, born in Missouri; parents born in Indiana; widow; occupation: stenographer, [..unclear..]. 1880 census, Beaty Township, Carroll County, Missouri; roll T9-679, ED 151, page 456A, line #44, dwelling #152, family #153. Indiana Work Projects Administration, 1941; book C-I, pg 531. RootsWeb WorldConnect GEDCOM from John Helms (). 1850 census, Harrison Township, Wayne County, Indiana; page 45, line #12, dwelling #32, family #32. 1860 census, Harrison Township, Wayne County, Indiana; page 489, line #29, dwelling #15, family #15.